For this Spotlight, we are proud to be partnering with AVA – Against Violence and Abuse – a leading UK charity committed to ending gender based violence and abuse. Our seventh Spotlight focuses on victims and survivors of domestic abuse who experience mental health difficulties. We know that domestic abuse can have a severe and lasting impact on mental health, and that survivors often find it difficult to access the support they need. 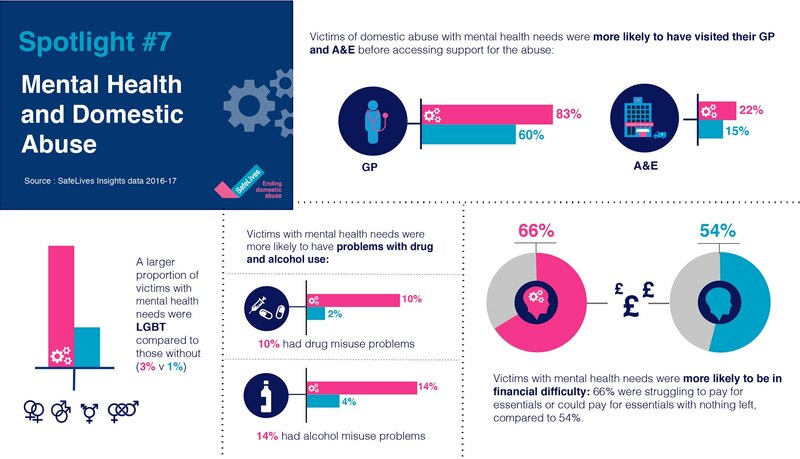 Our research also shows that victims and survivors with mental health problems are more likely to have other complex needs. We must see the whole picture for every victim, survivor and family so that everyone can be free to live the lives they want to live. Through a combination of blogs, podcasts and videos, we’ll be posting the latest research, practical resources and guidance. We also want to hear from you: join the conversation on Twitter, using the hashtag #SafeAndWell. You'll find new content every week – so bookmark this page for the latest updates, and follow us on Twitter and Facebook to stay in the loop. Kathryn Lake, Mental Health Community Nurse for the Norfolk and Suffolk Foundation Trust – Domestic abuse: how can Community Mental Health Nurses respond? Collette speaks to Kathryn and Shakti, who both work in the domestic abuse sector, about their experiences of domestic abuse as children and the impact on their mental health. Brandy speaks to Jane from Shared Lives, a national scheme in which people with additional needs including mental health problems, move into the home of an approved Shared Lives carer. Also joining them is Natalie from SafeLives, who is working with Shared Lives to pilot the Shared Lives intervention for survivors of domestic abuse. Gene Feder talks about the results of a trial which provided domestic abuse workers with the skills to offer mental health support to their clients.